Vintage style at its best, mix in lace straps, beaded bodice with an oh so flattering mermaids skirt. The makings of the Alexia Mermaid Wedding Gown is the dress you have been searching for at the price point that will make you smile! It does all this in pure vintage style that includes touches from the past which translate into the present. The fully boned bodice is expertly beaded with a lace up back. The dress flows from the bodice to the floor into an elegant 25 inch long train. 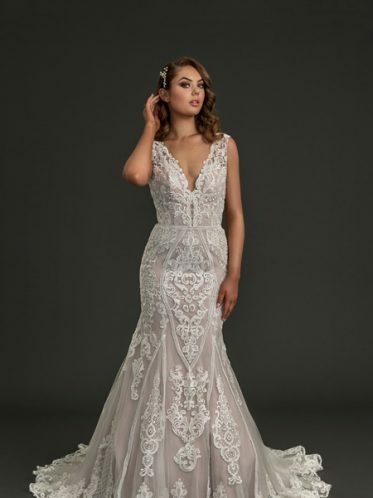 The under and over layers of the dress come in either latte and ivory as shown, or ivory and white to create a perfect understated contrast from which the gorgeous lace design can be seen. Features of this divine wedding dress style. Such a dress does not require any over the top extras as it really is a standalone piece. Alice and Patience wedges keep it simple while matching the vintage vibe of the dress and ensuring your feet won’t hurt at the end of your wedding day so you can dance until dawn. These hair combs have just the right heritage feel to make them excellent hair accessories to go with this dress and its suggested look. 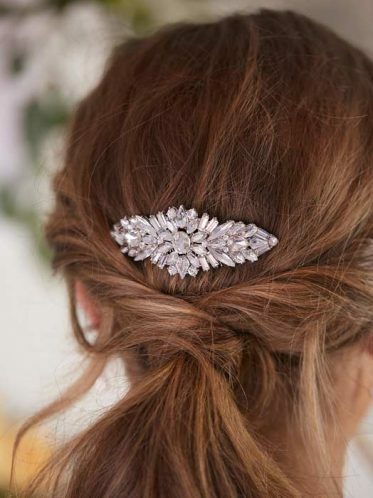 This Cinderella wedding comb uses crystals in a very vintage style while the Melbourne wedding comb looks like something precious out of your grandmother’s accessories drawer. Either of these worn on the side with loose locks or at the back incorporated into an updo, will fit right in with the aesthetic of this dress. Bridal stylists are here to help get your overall look right for your big day. Offering in store alterations on dresses so that every bride can look their best. We have Ginger pins our in store alterations team that will be able to take up your hem line, shorten the straps and bustle up the train. There is also the possibility of turning Alexia into a long sleeve wedding dress.